Part of the legend of the American West has always been slot canyons--unassuming cracks in the ground that cows or cars could suddenly slip into and never be seen again. However, now that most of these chasms have been explored, they offer unparalleled opportunities for adventuring. Imagine ducking beneath the summer heat into a shady grotto, running your hands along cliff walls on either side of you as you slosh through pools of cool water and gaze up at a sliver of sky, while the interplay of reflected light produces spectacular color shows on the rock. This is canyoneering. In general terms, a slot canyon is any gorge which is deeper than it is wide, but the name connotes towering walls that are so close together you can span them with your arms. These special geologic formations create unique terrain challenges that fall somewhere in between hiking and caving. The highest concentrations of slot canyons are in Southern Utah, where storm water cascades off of plateaus that are elevated on easily erodible sandstone. However, narrow gorges can also be found in the volcanic rock of the Northwest, the granite of California and Nevada, and the multi-layered cliffs of Arizona. In suit with with their variety of occurrence, slot canyons come in a diversity of form. Some can simply be walked through, but others require boulder scrambling, swimming, rappelling, or even more difficult maneuvers. Any canyon that warrants ropes and other vertical safety equipment is a technical canyon, while those that are relatively straightforward are considered non-technical, though rock scrambling and swimming are not out of the question. Technical canyons are only for those with canyoneering and rope systems experience. For beginner canyoneers, non-technical canyons are the way to go, but there are still some particular precautions to be taken. The number one danger in slot canyons is flash flooding. Rushing water is precisely what forms these gorges, and getting caught in a flash flood can be deadly. Check the weather before you go, and if there is any chance of rain, stay out of slot canyons. Other risks include hypothermia and heat exhaustion (yes, both, even in the same canyon on the same day). The deeper and narrower a canyon is, the more likely it is to have pools of retained water that never see sunlight, so they stay as cold as rainwater all year long and require wetsuits. But even the chilliest canyons may have hot, exposed hikes before or after the narrow sections, so you must be prepared for desert hiking as well. The key is to research your intended route ahead of time to know what to expect. 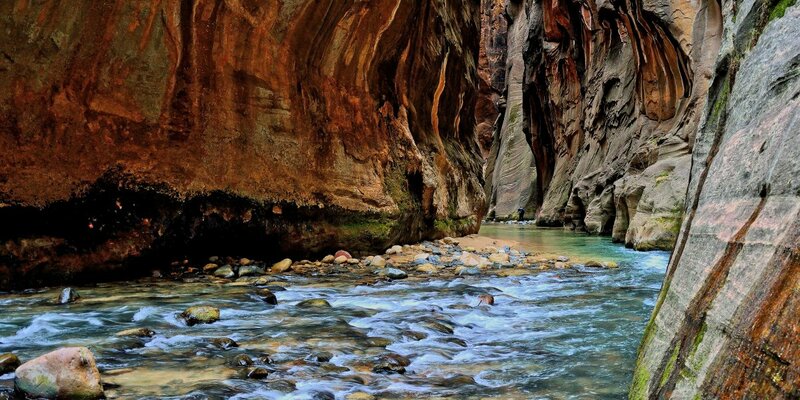 The Narrows in Zion National Park. Photo by John Cody. Check out the following adventure guides for some ideas and instruction for various slot canyons in the West. This is by no means an exhaustive list, but it presents some of the best suggestions for slot canyons to explore. In the Northwest, Oneonta Gorge is appropriate for beginners during the right time of year, while the daunting Gates of Valhalla present a multi-day challenge for advanced canyoneers. When visiting Yosemite National Park in California, Tenaya Canyon should be on the list for experienced canyoneers. This technical descent involves bushwacking, water crossings, and long rappels. The mother lode of slot canyons is in the Southwest, where narrows of all sizes and difficulties can be found across a landscape carved by time. Zion National Park is famous for its sandstone slots, most notable of which is The Narrows, a non-technical journey in the Virgin River where it forms one of the largest slot canyons in the world. Pine Creek Canyon is a technical but ever-popular descent through a steep slot dotted with frigid pools. The Escalante region of Utah also contains many slot canyons, including the incredibly photogenic Zebra Canyon with its undulating walls of pink sandstone. Also worth visiting are Peek-a-boo Gulch and Spooky Gulch, which are some of the narrowest slots you can find anywhere. The phenomenal Little Wildhorse Canyon sits farther north in the San Rafael Swell. It doesn't require any equipment or training, and you can choose between shorter and longer hikes depending on your itinerary and endurance. On the Utah-Arizona border lies Buckskin Gulch, which is reputed to be the longest slot canyon in the world. Yet even for its entire length, it requires no technical skills, only lots of wading and some boulder scrambling. Further into Arizona is what may be the most-photographed slot canyon in the West, Lower Antelope Canyon on the Navajo Reservation. This otherworldly chasm fascinates with its orange walls and midday sunbeams that strike the sandy floor. Not far from Antelope Canyon you'll find Rattlesnake and Owl Canyons. You'll have to visit these canyons on a tour, but it's worth it to see the beautiful great horned owls residing in the canyon. Canyoneering is a singular experience that cannot be had just anywhere. Formation of slot canyons requires a special combination of geology and climate that happens in very few places, but the American West is one of them. With the bounty of slot canyons strewn across the landscape, there is an adventure to fit any experience level, but proper planning and preparation are always key to a safe and enjoyable journey. Use these guides to gear up for the wild, subterranean world of slot canyons. Some of the best slot canyons in Zion NP are: Subway, Birch Hollow, Key Hole, and the very best is Mystery Canyon. There are great slot canyons in Arizona (Coconino and Tonto NF), Bear, Sundance, Wilbur, Little Lo, etc. Kanarra Creek in Kanarraville Utah, north of Zion Park off the 15, is a beautiful and accessible day hike into a great slot. The trail is accessible year round. Spring and Fall are ideal to beat the southern Utah heat. However, winter is gorgeous in the snow.